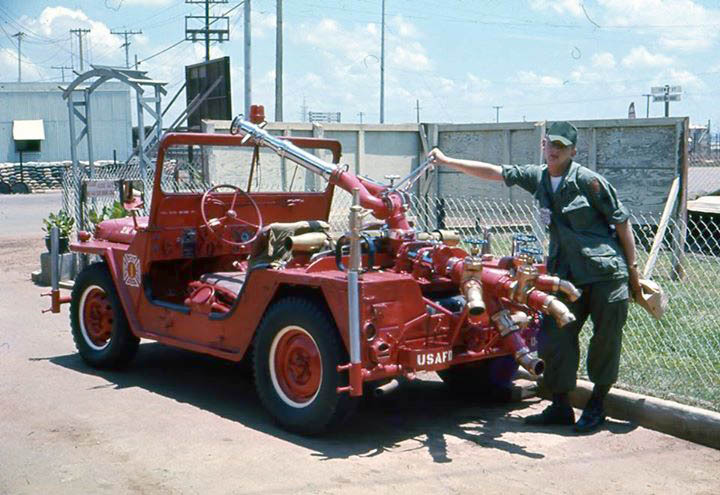 Fire protection at U.S. military installations during the war in Vietnam was provided by a combination of military personnel and civilian contractors. Typically small bases and airstrips were covered by Army and Air Force firefighting detachments, while larger installations had fire departments manned partly or entirely by civilians. 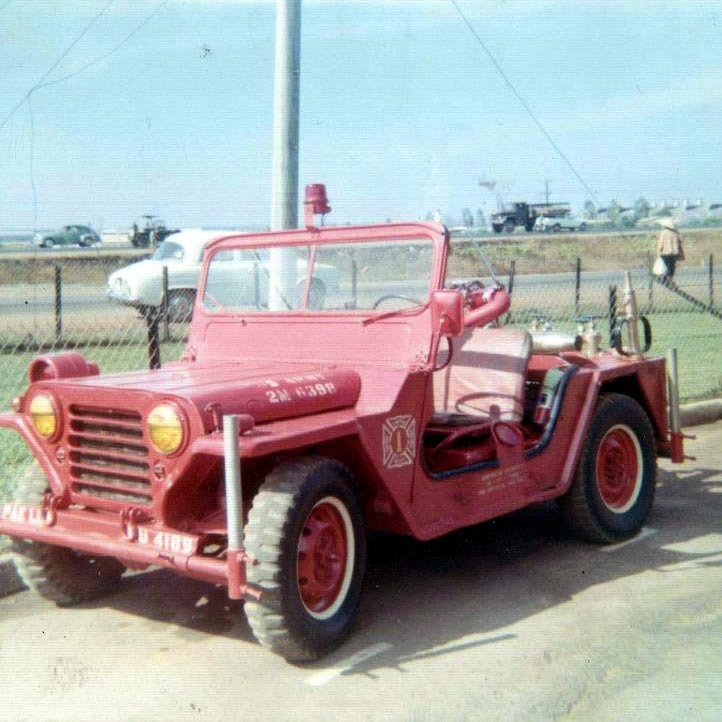 This photo shows a fire station at Long Binh Post, east of Saigon, in 1969. 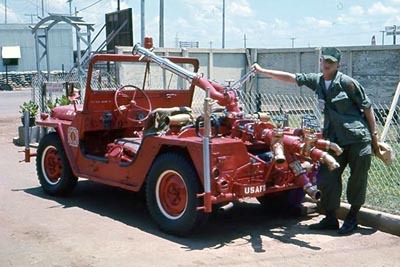 The 6x6 trucks are examples of the 530B pumper built on the M-44 2 1/2 ton chassis, the most common fire truck used by the U.S. Army during the war. 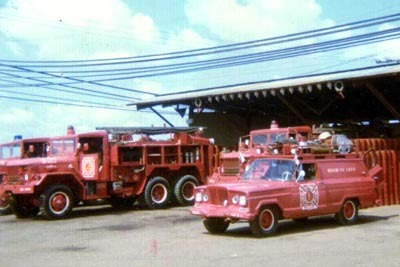 According to Kaiser 6x6 Fire Trucks on CJ3B.info, Kaiser Jeep built some 150,000 of the M-44 series trucks, starting in 1964, so some of the 530B pumpers were likely cousins of the 1962 Jeep Wagoneer in the foreground here. 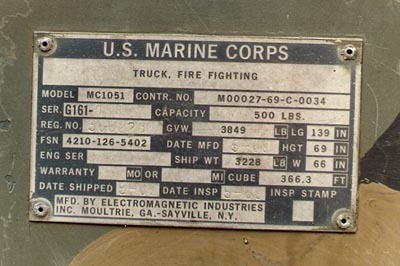 See lots of information and photos of these trucks, on the "Vietnam War Firefighters and Fire Apparatus" page at Fire Trucks at War. 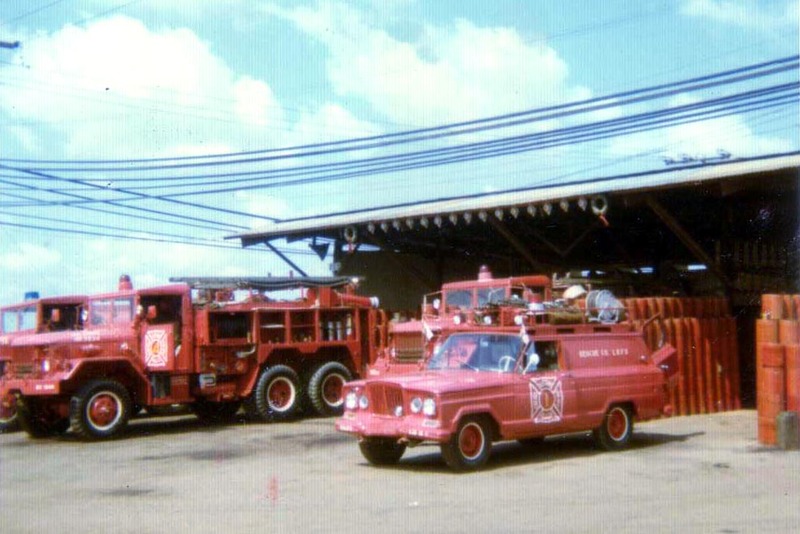 This photo of Long Binh FD Rescue 1 in service at a MUTT rollover circa 1969, is courtesy Anthony Dillon. 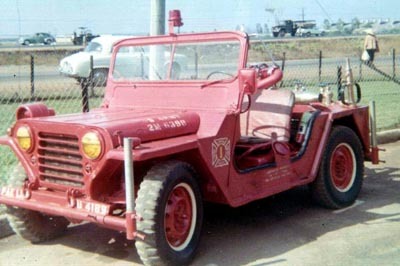 Rescue 1 was one of a number of vehicles converted by the LBFD for use on the base, which was the equivalent of a small city. 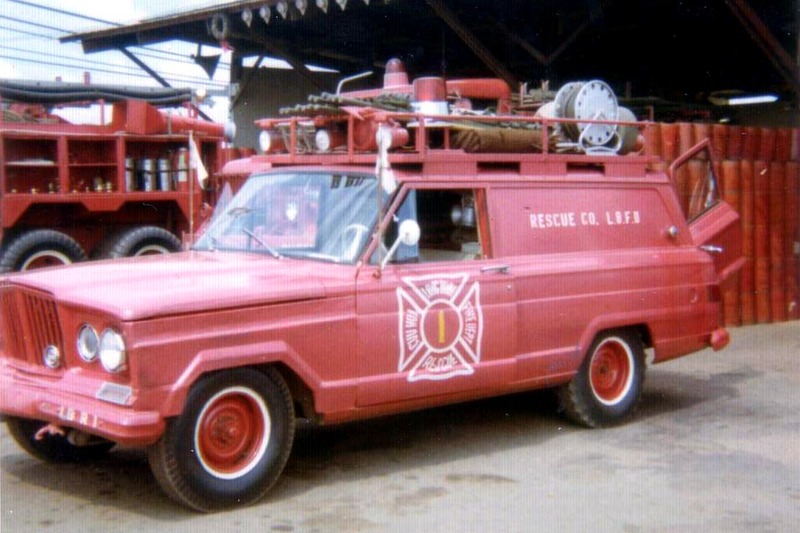 Rather than having its body modified to increase capacity, this 1962 Wagoneer Panel Delivery carries bulky equipment including rope and stretchers, in a cargo rack on the roof. 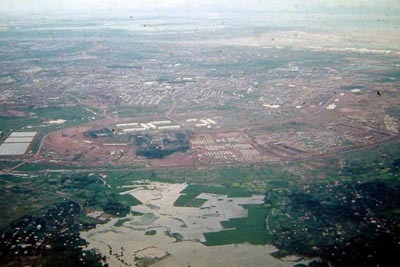 According to Wikipedia, Long Binh Post was the largest U.S. Army base in Vietnam with over 50,000 women and men. It had hospitals, air conditioned office buildings, restaurants and night clubs, swimming pools, tennis courts, golf driving range, a bowling alley, and a bank. 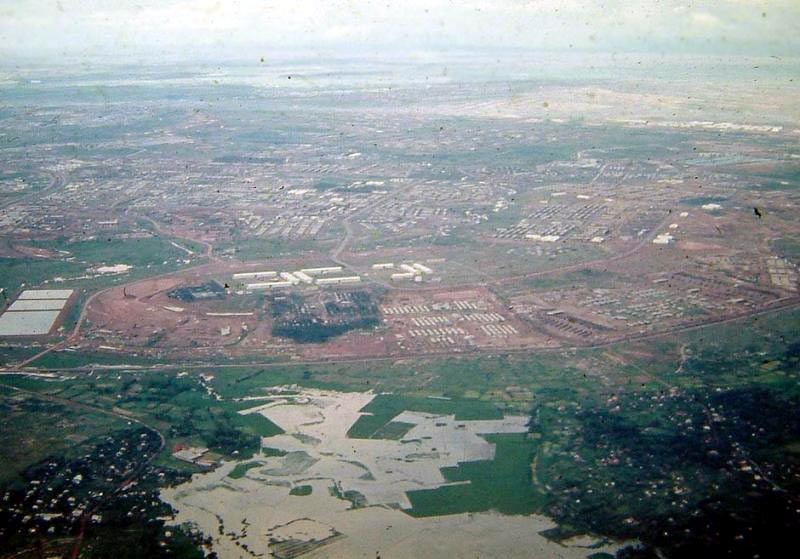 This 1968/69 aerial photo was taken by David Parsley. 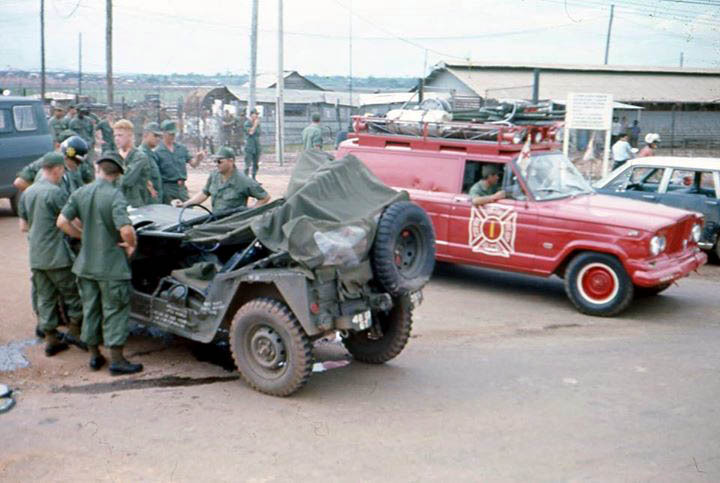 Challenges for firefighters at Long Binh ranged from Viet Cong attacks on the huge ammo dump, to an outhouse fire (40K JPEG) photographed in 1968/69 by Bob Hersey of K Troop, 11th Armored Cavalry Regiment. 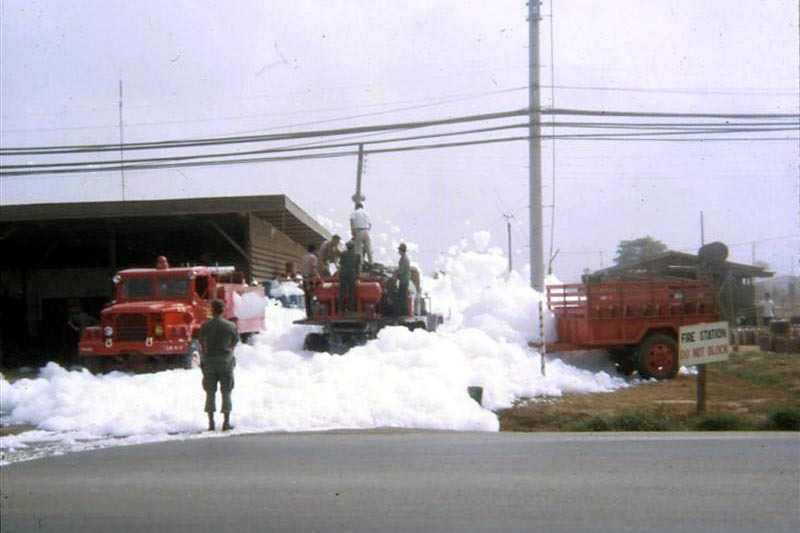 Gregory Farris of the 71st Transportation Battalion took this shot as he was passing the Long Binh fire station and saw this massive display of foam. 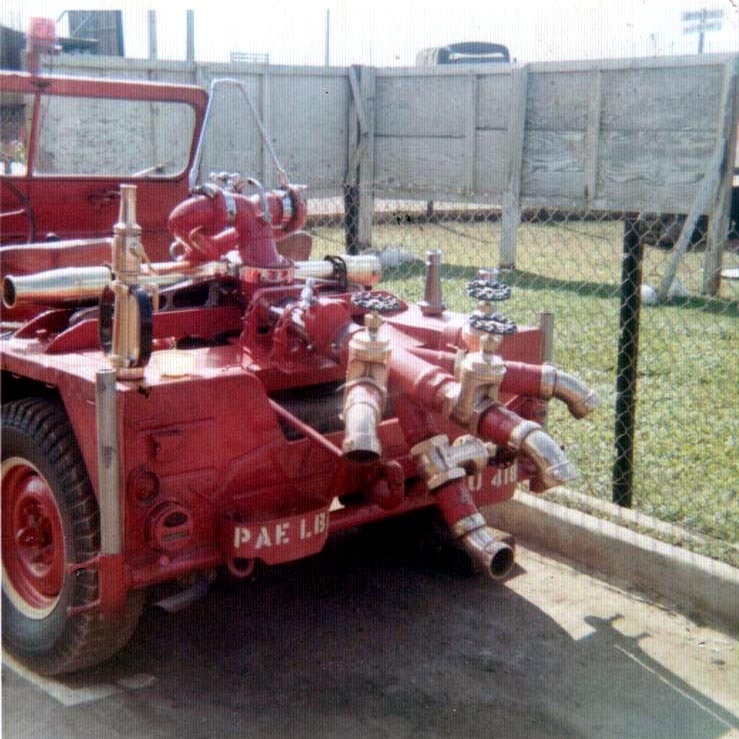 The truck producing the Hi-X foam appears to be the same one seen in a 1971 front view photo (60K JPEG) in Fire Trucks at War. 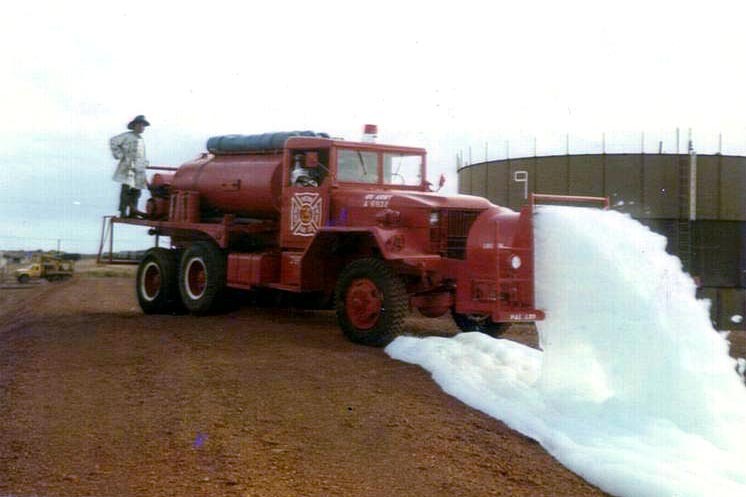 Long Binh FD also built an astonishing custom foam rig based on an M-113 armored personnel carrier (100K JPEG), and equipped with 900 gallons of water, 110 gals of protein foam, and 200 gals of Hi-X foam. 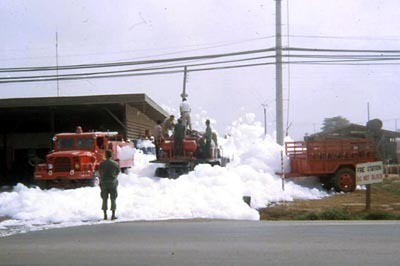 LBFD's creativity didn't stop with rescue and foam trucks. 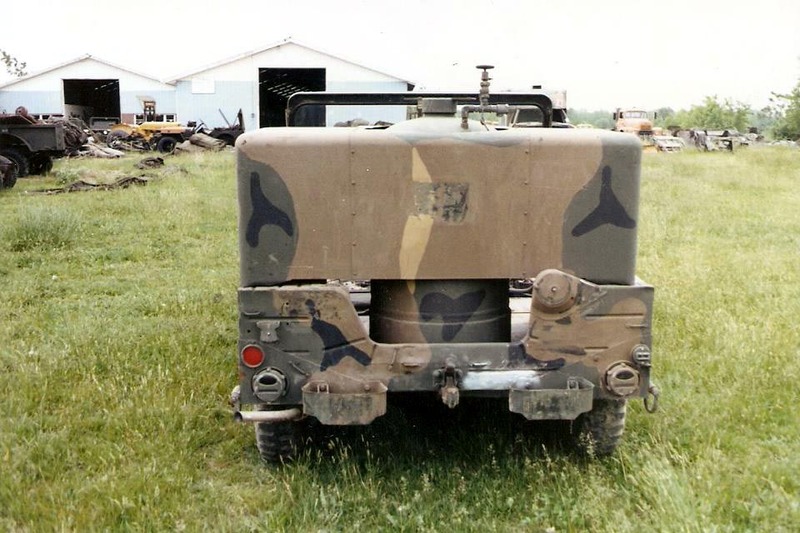 They appropriated this M151 MUTT in order to build a self-propelled deluge gun. It's one MUTT that really helps the vehicle live up to its name, "Multipurpose Utility Tactical Transport." 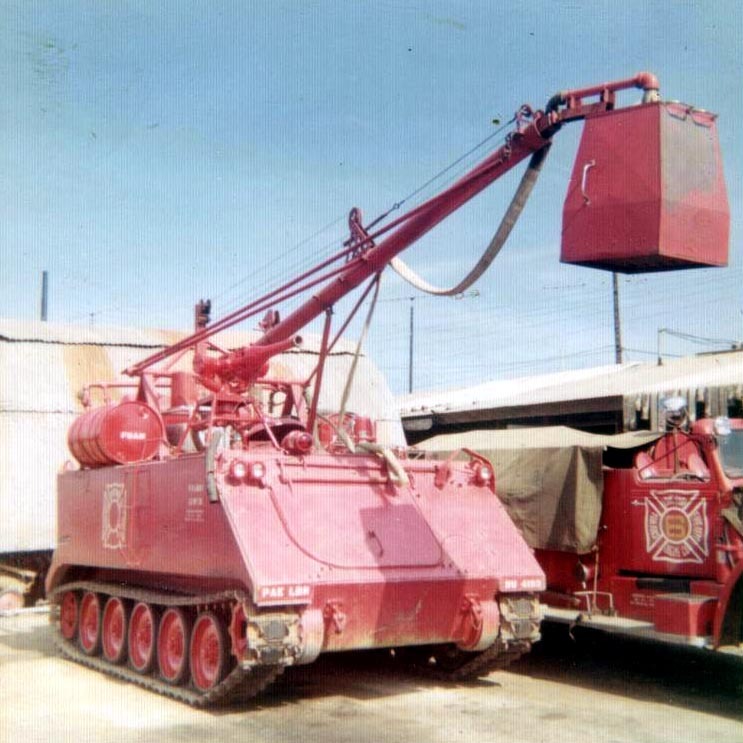 Like some big-city fire departments, LBFD probably discovered that there were plenty of alleyways and other tight spots where it was difficult to get the big 530B pumpers close to a fire. And like the Chicago FD, they realized a Jeep was a good way to lay hose in and get a master stream close to the blaze. 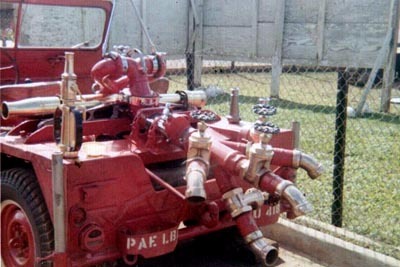 "PAE LB" on the bumperette stands for "Pacific Architects and Engineers, Long Binh." PA&E was one of the principal holders of civilian contracts for military operations in Vietnam, and is still a major provider of logistical and support services to the U.S. and other governments. 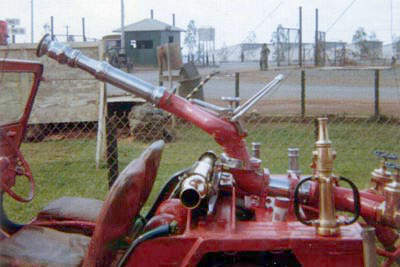 The plumbing on the back of the MUTT allows the deluge gun to be supplied by up to four 2.5" lines. In this photo circa 1969, courtesy Anthony Dillon, the MUTT has been relabelled for the USAF. Fire Trucks at War also came across this MUTT formerly in service as a dry chemical crash truck for the U.S. Marine Corps. Equipped with a 500-pound dry chemical tank, it would also have had a nitrogen tank mounted in place of the passenger seat. 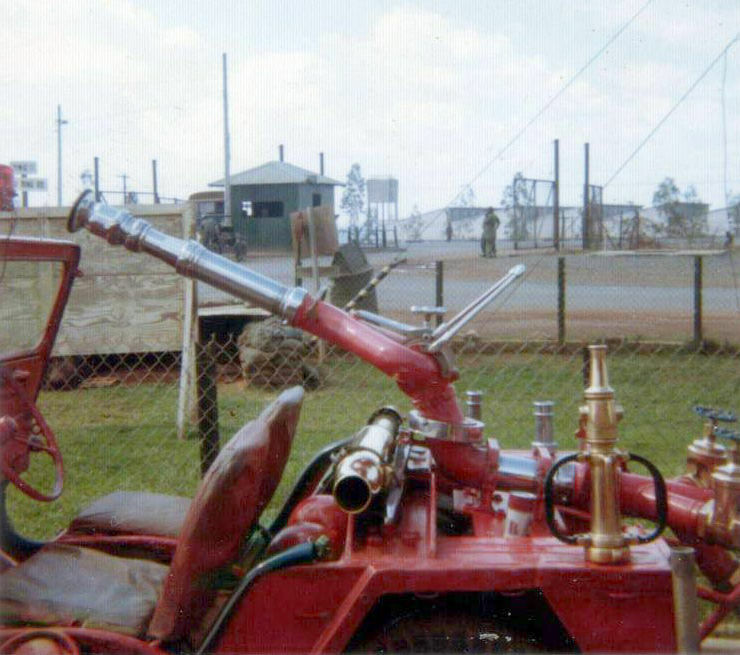 It carries extinguisher mounts on the front bumper. See also left side (120K JPEG) and rear view (120K JPEG) photos. 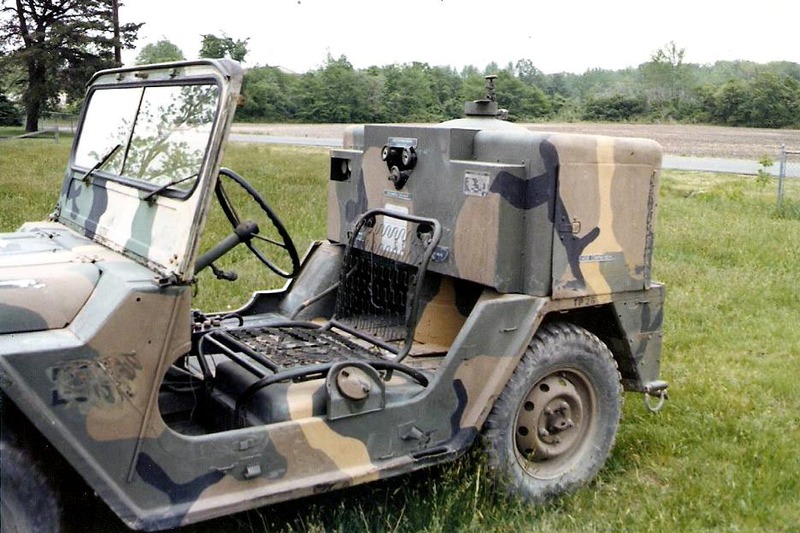 This Jeep was not a field conversion, but rather was built in 1969 by Electromagnetic Industries Inc. of Georgia, who built a variety of products such as diesel generators for the military. 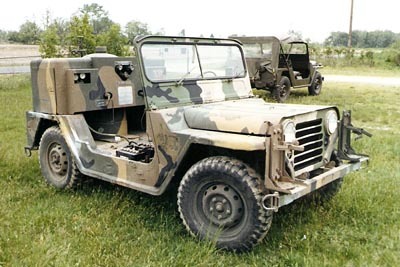 The design is very similar to the dry chemical Jeeps built for the civilian market by Ansul Chemical. 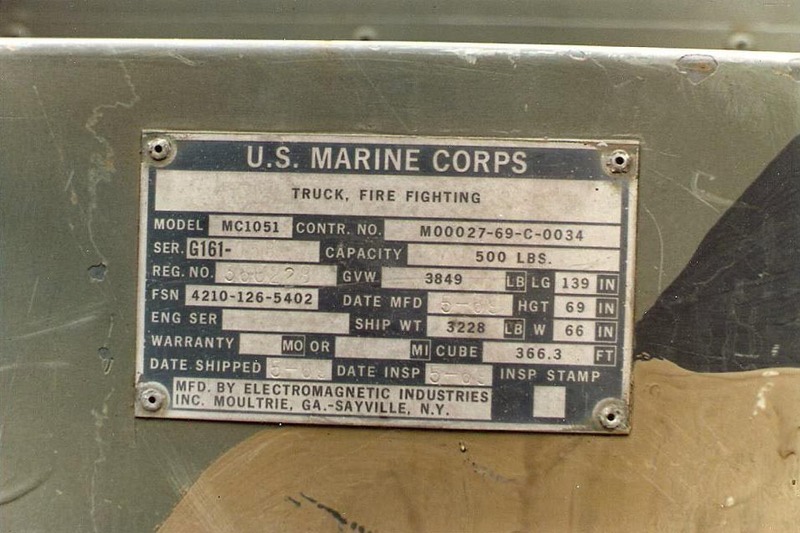 Further details, such as how many of these units were built for the Marines, are needed. 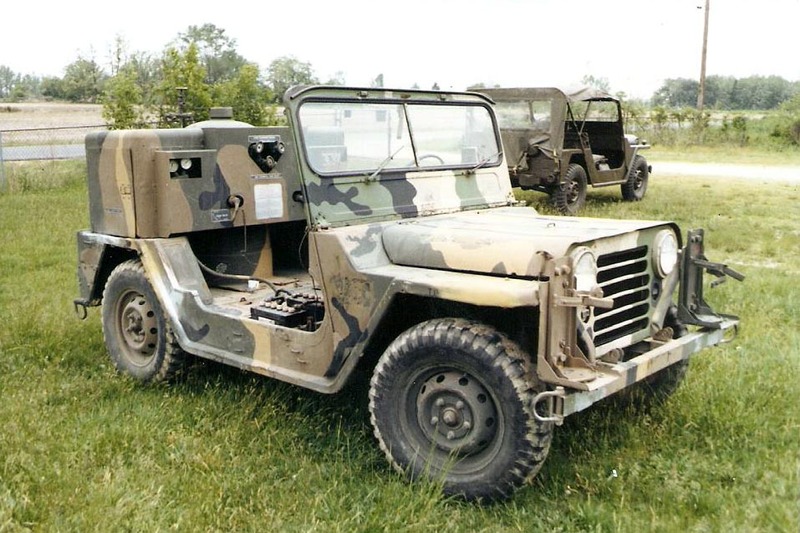 See more Military Jeeps on CJ3B.info.